This crostini caters to both versions of myself. The domestic diva gets some bizarre project to cross off her cooking bucket list; the couch potato needs only to stand upright long enough to assemble the crostini and pour a glass of Chardonnay. It’s a great starter for an elaborate meal, ensuring you don’t get kitchen burnout by dessert. It also makes a good lunch on days when you don’t feel like making lunch. Not that we speak from experience or anything. First, prepare the toast. Preheat your oven to the broil setting. Place slices of bread on a large baking sheet and toast 1-3 minutes on each side, until barely golden. Remove from oven and cool completely. Next, toast the hazelnuts in a small frying pan over medium heat. Toss frequently until fragrant. Remove from heat and set aside. 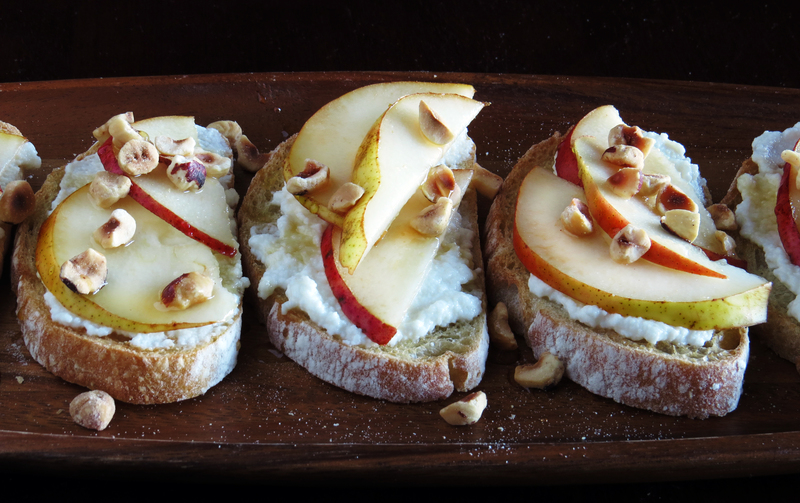 Finally, assemble the crostini by spreading some ricotta on each slice of toast. 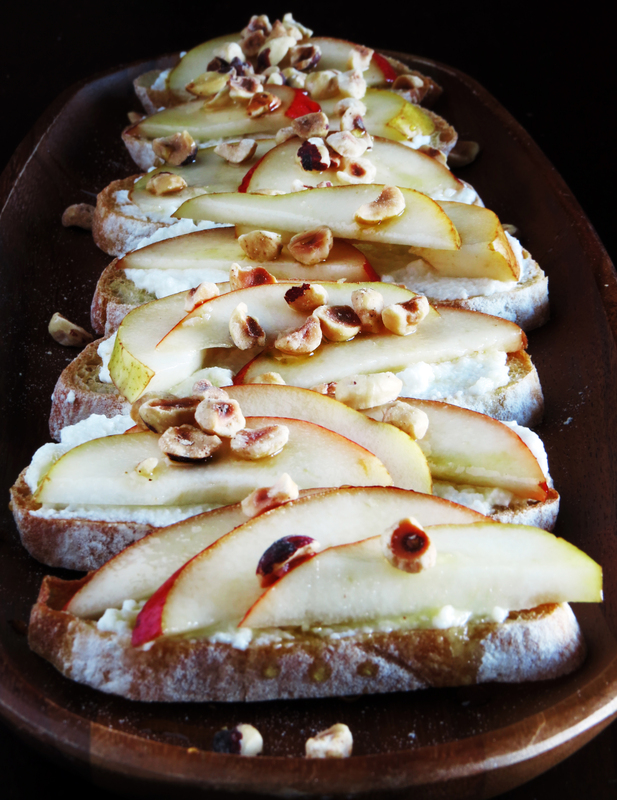 Place 2-3 pear slices on top and transfer to serving plate. Drizzle with honey and top with toasted hazelnuts. My ricotta recipe comes from Julia of Fat Girl Trapped in a Skinny Body, who reported ricotta success using only 1% milk. The consistency was on par with the grocery store tub, but I could definitely taste hints of lemon in the homemade version. (It was great on the crostini, however!) Julia posted wonderful pictures and more thorough instructions in her recipe, so I highly encourage you to visit her site before jumping in. Heat milk and salt in a medium saucepan, stirring constantly to prevent scalding. When milk reaches 190°, remove from heat and add lemon juice. Stir briefly to combine. Set aside for 5 minutes, allowing the curds to form. Drain ricotta by pouring through a cheesecloth secured over a large bowl. Drain two hours, then refrigerate.